The blue and white gingham shirt is a classic—one that can be worn with everything from white denim to wool trousers and unlined khaki blazers to charcoal suits. It's appropriate anytime of year, but looks particularly cool and crisp during the warmer months. And while they often feature button down or standard point collars, designers have recently cut the shirts in a range of spread collar styles, giving the all-American look a dose of British elegance. Made in America from British pima cotton broadcloth with a cutaway collar and natural Trocas shell buttons. The perfect accompaniment to a gingham shirt? A classic silk knit tie. 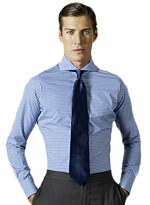 Made in Italy from soft broadcloth, with an extreme cutaway collar, mother of pearl buttons and French cuffs. Made from two-ply Italian cotton from the Thomas Mason mill in England, in a tailored cut with a spread collar.